July 26, 2013 November 19, 2014 / Julie Brook, Esq. Internet start-ups are exciting ventures that can achieve remarkable growth on a shoestring. But smart entrepreneurs realize the value of hiring attorneys to form a legal entity for their start-ups, whether the entity is a corporation, partnership, or limited liability company. If a start-up comes to you for help, would you know the key pre-formation questions to ask? Figure out the division of equity. All participants need to discuss and agree on their commitments and expectations, including each participant’s time commitment and financial contribution. Clarify the division of labor. Make sure the founders’ respective roles in the venture are clear. Be careful not to assign fancy titles to participants at this point, because investors will want to hire the best people for senior management roles. Play the name game. Check the availability of or reserve the entity name in the corporate (or partnership or LLC) records of the intended state of incorporation and the states where the entity will do business. Protect the intellectual property. Before the participants share the business concept with outsiders, they should consult an intellectual property lawyer and discuss the availability of patent or copyright protection. Consider the Break-Up Scenario. Usually not a topic founders want to discuss, but they should consider whether they want to provide for contractual dispute resolution or a buy-out mechanism. When there are multiple founders and work is beginning, forming a business entity makes sense. And bringing an attorney into the mix can save start-up founders from the inevitable errors made when they go for a “do it yourself” solution. Attorneys need to be ready to answer questions and to lead their clients through the process as quickly and easily as possible. 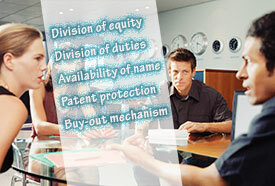 CEB’s got your back as you counsel clients through formation of business entities. There are more details on each of steps outlined above in Riaz Karamali’s article Starting Up the Start-Up in the Spring 2013 issue of CEB’s California Business Law Practitioner, a must-have subscription for California business attorneys. Online business issues are covered in CEB’s award-winning book, Internet Law and Practice in California. Also check out CEB’s Selecting and Forming Business Entities and the FREE program Making Sure You Get Paid: Accounts Receivable Management, available On Demand.